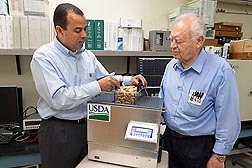 ARS engineers Samir Trabelsi (left) and Stuart O. Nelson (retired) test a sample of peanuts for moisture content using the new moisture-sensing meter they invented in Athens, Georgia. A new meter developed by Agricultural Research Service scientists to measure the moisture of peanuts inside the shell, or pod, has been licensed by a manufacturer of agricultural-use instruments. The moisture-sensing meter was invented by engineers Samir Trabelsi and Stuart O. Nelson (retired) in the ARS Quality and Safety Assessment Research Unit, in Athens, Georgia. “It is important that peanuts are dried to a kernel moisture content of less than 10.5 percent for storage purposes, because higher levels can lead to fungal growth,” says Trabelsi. The meter is based on patented low-power microwave sensing technology and an algorithm that produces a crop-specific moisture calibration equation—also developed by Trabelsi. The equation is used to customize an individual meter for use with a specific crop type. The components of the microwave meter include a peanut-sample holder, a power source, a “mixer,” and two antennas facing one another. The mixer compares the microwave signal transmitted by the first antenna into the peanut pods with the microwave signal received by the other antenna, after the signal has passed through the sample material. “The microwave circuit measures the loss of energy and the change in the speed, or velocity, of the microwaves as they pass through the pods,” says Trabelsi. When a sample material is exposed to microwaves, part of the wave is transmitted and part is reflected, or not transmitted, providing the individual “electrical signature” of the sample material being tested. “Our patented calibration method uses this information to produce a moisture calibration equation that is programmed into the meter,” says Trabelsi. Peanuts are normally dried to a moisture content of less than 10.5 percent for storage. 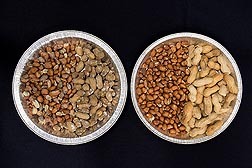 Higher levels of moisture can lead to fungal growth (left) compared to properly dried, fungus-free peanuts (right). Drying is an essential task that takes place at farms and at local peanut “buying points” right before the grading process. U.S. peanuts are required by the U.S. Department of Agriculture to be inspected at these buying points, and farmers take their peanuts there to be weighed, cleaned, inspected, graded, and ultimately purchased. Local buying points are under contract to peanut product manufacturers and shelling plants, where further grading takes place. During peanut grading, inspectors determine quality factors such as peanut size, shell size, peanut damage, foreign-material content, and kernel-moisture content. Representative samples of harvested peanuts are taken from the farmers’ transport vehicles, and the peanuts must be removed from their shells before moisture content is determined. If the kernel moisture content is too high, the sample is marked “no sale,” and the corresponding lot of peanuts has to be taken to the drying shed for further drying. 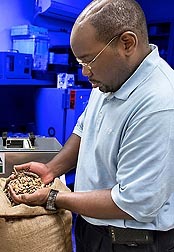 Postdoctoral engineer Micah Lewis visually inspects peanuts for quality factors before checking the peanut moisture content using the meter behind him. During 2012, Trabelsi worked under an agreement with Dickey-John Corporation, based in Auburn, Illinois, a wholly owned subsidiary of TSI Incorporated, based in Shoreview, Minnesota, to build a working prototype of the latest version of the patented in-shell peanut moisture sensor. “The prototype, together with our marketing research, allowed us to evaluate the accuracy and effectiveness of the sensor and get a better sense of what we needed to do to bring the meter to commercial markets,” says Beau Farmer, chief technology officer with TSI. The technology allows government inspectors to skip the labor-intensive step of shelling peanut samples from lots prior to measuring moisture content. “A version based on the same technology could also be developed for farmers who want to test their peanut pods before sending them off for grading,” says Farmer. In addition to moisture content, the instrument can also reveal bulk density of the peanut pods. This is important because that measurement reveals the size and quality attributes of the peanuts inside the shell. “A higher density may indicate a higher peanut meat content,” says Trabelsi. “The first generation of meters available commercially will be used to measure peanut moisture in cleaned peanut pods,” says Trabelsi. But the researchers have also been working for several years on developing a sensor system that rapidly and accurately measures moisture content and density of cereal grains, oilseeds, and tree nuts for use on production lines and in processing applications. Trabelsi’s microwave moisture-sensing technology can be used to measure moisture in harvested grain, although the calibration equation will be different for cereal grains than for peanuts. The method can perform better than existing technologies and has the potential to benefit both the peanut and grain industries, according to Trabelsi and Farmer. “The microwave moisture-sensing technology is a revolutionary application for in-shell peanut testing,” says Farmer. “We wanted to develop a portable system for moisture measurements of unshelled or shelled peanuts that can be used at peanut-grading stations and possibly in the farmer’s field. We are working hard on the underlying commercialization effort required to roll out these meters and satisfy market demand.”—By Rosalie Marion Bliss, Agricultural Research Service Information Staff. Samir Trabelsi is in the USDA-ARS Quality and Safety Assessment Research Unit, Richard B. Russell Agricultural Research Center, 950 College Station Rd., Athens, GA 30605; (706) 546-3157. "Moisture Meter Technology for In-Shell Peanuts Licensed" was published in the August 2014 issue of Agricultural Research magazine.